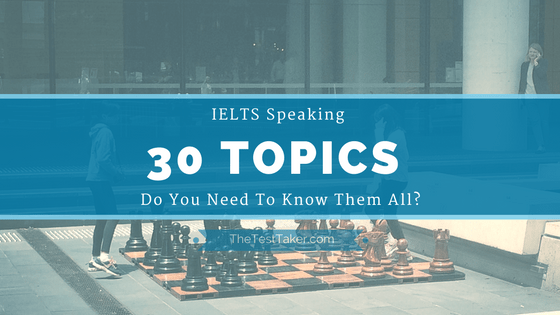 30 IELTS Speaking Topics: Do You Need To Know Them All? Do you want to know what topic you will be asked on your exam? Of course, you do, right? In this way you can focus all your energy on related vocabulary, read multiple sample answers and, basically, do everything you can do to get ready to give good answer. Unfortunately, there is no way we can predict such things. However, there is a way to increase your chances of getting good score in speaking test. I just wanted to share my knowledge and my thoughts about common topics for IELTS Speaking test as well as to give some useful links to helpful resources. How Many Topics There Are? According to official IELTS website, in part 1 “examiner asks the test takers general questions on some familiar topics such as home, family, work, studies, interests…”. If you browse the web and research IELTS text books you find out that there are tens of questions. Check out this website with 135 part 1 questions. You probably know Simon from ielts-simon.com. He did a great job and In May 2016 reposted one of his old posts called “IELTS Vocabulary: topic list”. There is a list of 24 common topics (not only from speaking part). In part 2 they usually ask you describe someone or something. These questions, also cover, I would say, 15-20 common topics. Part 1: Who was your favourite teacher at school? Part 1: Do you use the Internet much during the day? Finally, we’ve got part 3 questions. These are discussion type questions. You can take a look at some of them in this article “IELTS Speaking Part 3: 50 Practice Questions by Topic“. Again, as you can see, they are mostly cover the same topics from part 1 and part 2. So basically, there are, probably, 30 common topics. Maybe you found more. I don’t know. Is it too much? Do you need to know them all? It depends. Let’s try to speculate and find the answer this question. I think, when preparing for IELTS speaking test, you don’t need to embrace and try to prepare 30 topics. The goal is to pass the test, not to learn 30 english topics. I’ve passed IELTS scoring 7 and I’m pretty sure I went trough 10, maybe 15 topics. There is a chance I got lucky, but I can give you at list 3 reasons why you can and should limit number of topics prepared. 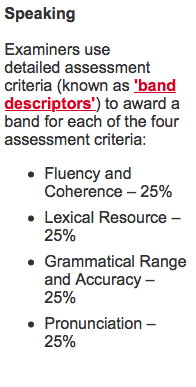 As it can be seen, having good lexical resource is only 1/4 of overall band. it is also important spend time improving fluency, pronunciation and grammar. Limited time. I remember very well the time when I was preparing for the test. It is always not enough time. You have your studies/work/famiy and other parts of your life. You cannot ignore them. You also need to sleep well. That means you have very limited time to cover each parts of exam. Allocating too much time for one part most likely will hurt other parts. I am a big fan of podcasts, so I listened them almost everyday. I found something I was interested in and listened it. I wasn’t trying to choose specific topics and cover most common areas from IELTS. As time went, I noticed that it was kind of natural process. In every episode of podcast I could find vocabulary from different topics. Now I truly believe that it was great decision. I was consuming audio content on everyday basis which resulted in consistent improvement of my lexical resource in a wide range of topics. With al that being said, I think the best strategy is to start from simplest and most common topics. Just choose 5 of them and start practicing. Stop researching. Stick to on or two resources/books and keep on moving. The Internet is a great place. There are tons of free resources, but oftentimes it a drawback. We easily switch from one shiny object to another and don’t do what we really need to do. Remember, precise makes perfect. That’s what moves us forward, not huge lists of questions and vocabulary lists. Do not try to dive into each topic too much. I suffer from my perfectionism all the time and I know how badly it can affect your time management. I, personally, spent for each topic I reviewed one day and then moved to the next one. Along with this, I would highly recommend you to find topics and materials you are interested in. They will learn you to enjoy english language and help you to achieve your desired score quickly. You can easily find questions for these topics on the web or go to click links above and use my articles. For each topic, I tried to aggregate part 1,2 and 3 sample questions and answers, key vocabulary, definitions and links to useful resources. I hope it will save you some time. Check them out and let me know if they were useful. It can be difficult initially. Do not give up. If other did it you can do it too.